Need more information about booking Home 9241307 ? 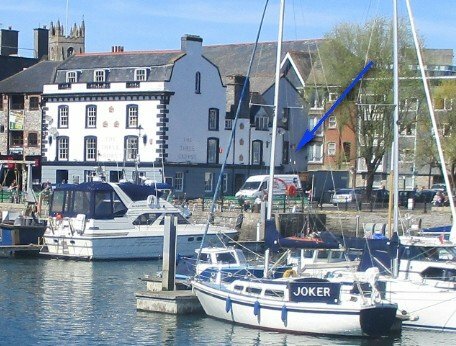 Charming one bedroom flat located in the heart of Plymouth's historic Barbican. The flat has just been completely refurbished in a modern contemporary style. It is ideally located to explore historic Plymouth,being close to and with views of the Harbour,it is also within 10 minutes stroll of the Hoe and City Centre. The Barbican itself is the perfect holiday base,it has numerous restaurants, pubs and bars to suit every taste.There are endless things to do including visiting the National Aquarium,an intimate Theatre, Comedy club & Plymouth gin distillery tours. From the Harbour there are boat trips and boat taxis to various places including Cornish beaches. There are also fishing trips. The flat itself is very spacious with a Juliette balcony. It has been refitted to a very high standard and includes gas central heating, washer dryer , dish washer, electric oven, induction hob, fully equipped kitchen, modern waterfall shower, internet tv etc. This Apartment has 1 bedroom, 1 bathroom and sleeps 2. It’s been listed on Holiday Lettings since 17 Jan 2018. Located in Devon, it has 4 reviews with an overall rating of 5. The average weekly rate is £521. Really nice well equipped flat on the edge of the Barbican area in Plymouth. The welcoming goodies were much appreciated (Beer, Wine, Fruit, Milk, Biscuits etc.) The flat is also well stocked with the essentials (spices, tea, coffee, washing & cleaning stuff, cling film, foil etc) so no need for a full shop when you arrive. Wi-Fi, Netflix & Amazon Prime also welcome.